Alexey Shved is a rookie guard for the Minnesota Timberwolves. Shved, a native of Russia, began his professional and international career in 2006, most notably as a member of the Russian national team. The highlight of his tenure with the national team took place last summer, when winning a bronze medal in the 2012 Summer Olympics at London. In that bronze medal contest, Shved totaled 25 points, during Russia's victory over Argentina. Since entering the NBA, Shved has put together a solid rookie campaign, averaging 9.6 points and 3.9 assists per game, earning him a spot in the Rising Stars Challenge at All-Star Weekend in Houston. Shved's team had high hopes entering this season, but a rash of injuries have caused the Timberwolves to endure a miserable year. Despite this situation, Shved has become popular with Timberwolves fans. Above are iFolloSports.com original photos of Shved appearing at the grand opening of a Spire Federal Credit Union bank, in the Twin Cities suburb of Maple Grove, Minnesota. The shots were provided by an iFolloSports.com contributor. 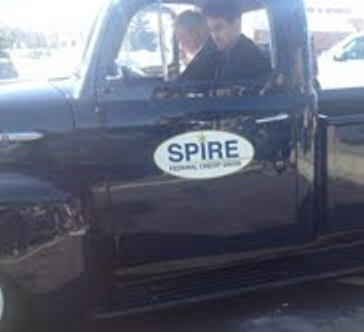 One of the pictures shows Shved in the driver's seat of the company's 1952 Ford pickup, known as “Archie.” The truck symbolizes the old fashion values the credit union was built on. A large gathering of fans lined up to see Shved and get his autograph after the conclusion of Saturday's opening ceremony.